Pale yellow straw color. Fruity, floral, yeasty aromas and flavors of meringue, spiced starfruit and asian pear, paper mache, and pressed flowers with a supple, bright, petillant, fruity light-to-medium body and a smooth, interesting, breezy finish imparting suggestions of honeyed kiwi, apple and clementine, hint of wintergreen and fennel, and seltzer water finish. A lively, fruity, lightly sparkling mead that is a pleasure to drink. 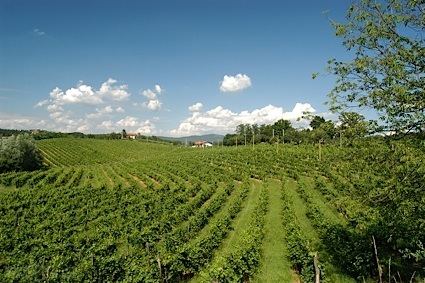 Bottom Line: A lively, fruity, lightly sparkling mead that is a pleasure to drink. 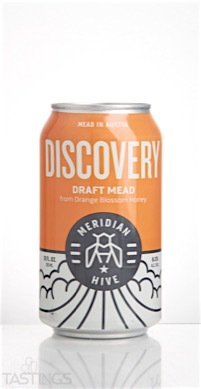 84 • Meridian Hive "Discovery" Mead 6.5% (USA) $4.00. 87 • Meridian Hive "Rhapsody" Mead 6.5% (USA) $5.00. 84 • Meridian Hive "Haven" Mead 6.5% (USA) $5.00. 91 • Meridian Hive 2014 "Bounty" Mead 14.5% (USA) $35.00. Meridian Hive "Discovery" Mead rating was calculated by tastings.com to be 84 points out of 100 on 12/14/2016. Please note that MSRP may have changed since the date of our review.